Cold Weather Toddler Clothes - Joyful Toddlers! It is getting colder and colder for most of us, and the thought of dressing toddlers for the cold strikes fear into the bravest heart! Last year’s clothes certainly don’t fit, and unless you have hand-me-downs, you’ll probably be looking for some new stuff. Let’s band together and share the wisdom in our collective consciousness: what works? What doesn’t? I’ll share some of my experiences with you, and I’d love for you guys to share some of your favorites (or things to avoid) in the comments, as well. Jackets: Young kids hate feeling bulky, but it’s really important to keep them warm because their skin is so thin and their organs are so small. I’ve found that a fleece vest with a lighter jacket overtop can work really well. If you pin the vest into the jacket, then you won’t double the time it takes to put them on; you just have two zips. Also, it can help to ‘build up’ to jacket weather by starting to put on an extra sweater each time you leave the house. If putting on extra clothing becomes part of your habits, there will be fewer objections when the clothing bulks up. What jackets have you found that work really well? Hats: For kids under 3, I really prefer hats that tie under the chin. However, kids like it best if you tie them to one side (under an ear) so the bow doesn’t feel bulky on their necks. Some kids do really well with wool, but others will be sensitive to how scratchy it feels on the sensitive forehead. I like hats that cover the ears, and have a soft lining. What hats do you find stay on? Mittens: Oh, mittens. I hate toddler mittens! The vast majority of them are too short, and snow will get between the cuff of the mitten and the cuff of the jacket. Most are also too bulky, so kids can’t do anything with their hands. No wonder they end up getting torn off! If it’s not too cold, I actually like those cheap dollar-store-type mittens the best, because they’re flexible and not too bulky, and kids will keep them on after they get used to them. Even doubled up, they’re less bulky and more flexible than most toddler mittens. If those aren’t enough because it’s too cold or too wet, then my favorite thing to do is put a pair of Smartwool socks over their arms (all the way up). They don’t come off, they’re warm, they’re less bulky and constricting than normal toddler mittens with all the stuffing and stuff, and kids can move their hands around inside of them. And no snow will creep into their wrists. More mitten tips: I like the old-fashioned mittens-on-a-string-through-the-sleeves. That way mittens never get lost, and it’s easy to tuck mitten ends into the sleeve cuffs. If you do use clips, clip the jacket side onto the sleeve itself instead of the cuff, so that you can tuck the jacket cuff into the mitten cuff. What specific type of mittens have you used, that work well? Snowpants: If it’s not too cold, I prefer lined rain-pants for kids. You can use them for muddy spring and fall as well. Get them a size or two bigger than you think, so that they can pull up high and not make a gap between the snowpants and jacket. OK, now it’s your turn. What tips to you have? What brands are your favorites? Feel free to put in links to actual items you like. What a sweet hat! I think this would be a hit, for sure. On snowy or really cold days my kids wear wool long johns around the house and step into snow-veralls when it’s time I go out. The long johns are sleek but warm and tuck nicely into the tops of tall socks for extra snow protection. 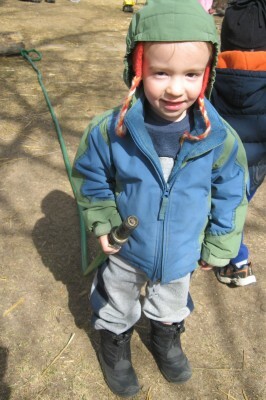 We also often layer a wool hat over a thin cotton pilot cap that my youngest wears all day on particularly cold days. In Alaska layers are essential, even under a snowsuit. Mittens…oh my, is there a perfect solution? To get used to playing and working with covered hands, we begin wearing mittens very early in the season and I agree that the stretchy dollar store type or a thin woolen mitten serves as a nice introduction to covered hands – soft, warm, flexible. Overtime we build up to the necessary thick waterproof mittens. Some companies make a ‘long-sleeve’ mitten which works very nice. Otherwise a tube can be sewn to the mitten that extends it up the arm/sleeve making it more secure. Another essential is a neck gator/neck tube made of fleece or wool. The long ones are the best because they can go up onto the head and serve as an additional layer under the hat while at the same time be pulled up from below to cover the lower part of the face (or tucked under the chin) without much bulk. I find scarves to be too bulky and just too much overall for little ones to deal with. And, Weleda’s weather protection cream is very nice for skin prep before heading out. Awesome! You guys really know how to do it up there in Alaska! That mitten harness looks like a great option for when mittens should be worn over top of the jacket. Anything where mittens don’t disappear if they get taken off and dropped. I also really like the idea of sewing tubes onto traditional mittens to make them longer. Thanks for sharing your knowledge! Hello Miss Faith and everyone! We recently moved from sunshine Florida to North Carolina. We immensely love to be here but we are not ready at all when it comes to clothing for fall / winter outdoor play. The clothing tips given in here are so great (as always) however I am not familiar with brands or the stores where I should by them from, most of all when it comes to rainoverall and boots which I definitelly need right now and long johns and undershirts which I will be needing in some point soon. Thank so much for all your help! Good luck with your move, Silvana! How exciting for you and your family. I don’t actually have a lot of great store sources–I mostly evaluated children’s clothes that they wore when they came to me at Rainbow Bridge. And if you have unlimited funds for new clothes, I would recommend getting these wool/silk long johns (they also come as onsies): http://www.urthchild.com/hocosa-organic-wool-silk-long-sleeve-shirt.html. They are so fantastic. If all of these prices are blowing your mind, try shopping at thrift stores. Most children’s clothes are far from being worn out, and you can find normally expensive boots, snowsuits, etc. Other moms out there, where do you shop? Hi there, your link to the boots was the same as the woolen shirt link. Which boots did you mean? Also, we used REI rain pants when we were in the San Fran area. However, we’re now in a colder state. Who makes good lined rain pants? Thanks for the helpful post, as well as mitten harness link! I don’t remember where the lined rain pants came from; I’ll look into it. You can put another warm hat over it on really cold days too. Can you say more about the “mittens on a string” trick? I am a total novice! I brought my 17 month old to daycare in a full on snowsuit the first day we reached 30 (we live in Wisconsin) and the teachers were very polite about it but my kid was definitely the only one bumbling around in a snowsuit. Live and learn. He rejected mittens in the beginning but is beginning to figure out that they serve a purpose– I love the smartwool sock idea! 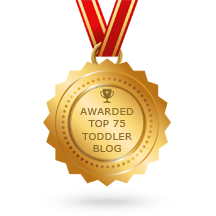 Fabulous for dry days– thank you for your post and your wonderful blog. Of course! Just measure a piece of string slightly longer than your child’s jacket from wrist to wrist (across the back) and sew one mitten to each end. Then run the string with the mittens through the jacket sleeves and voila! When your child takes off his mittens, they don’t fall down in the snow, they just dangle at the end of the strings. You can keep the string in the jacket all the time, so you never lose them or have to take time figuring out which one goes on which hand, etc. http://www.januarybaby.com sells mittens that are perfect for babies and toddlers since they cannot remove them. The mittens look like a fleece scarf that goes through the sleeves of the child’s coat. They are expensive though at $36 a pair.